Connect your Instagram account with WooCommerce. Showcase Instagrams from all over the world, showing visitors how your customers are showcasing your products. A license entitles you to 1 year of updates for 5 sites. Each installation of the plugin will require a license key in order for you to receive automatic updates. GOLD Membership. 500 Premium Plugins and Themes. Start FREE. With the Instagram extension, showcasing how customers use your products has never been easier. * Fix – Broken Instagram integration. Instagram authentication now works on OAuth 2.0. No need for username and Password in WP-Admin. * Fix – Added translation support by loading plugin textdomain. * Fix – Avoids “headers” error when connecting to Instagram. * Fix – Adds a check to see if WooCommerce has been network activated, when checking for the presence of WooCommerce. * Fix – Display the Instagram message even if no Instagram images are found for the specified hashtag. This helps to stimulate social interaction on Instagram. * Fix – Ensures the ‘headers already sent’ notice does not display, by starting the output buffer. * Fix – Fixes the connect/disconnect redirect URL to point to the correct admin screen if using WooCommerce 2.1 or higher. * Fix – Corrects the “page” parameter in the admin notice URL, for WooCommerce 2.1+ users. * /assets/css/admin.css – Optimises CSS to use correct LESS syntax and to correctly style the write panel icon in WooCommerce 2.0.x. 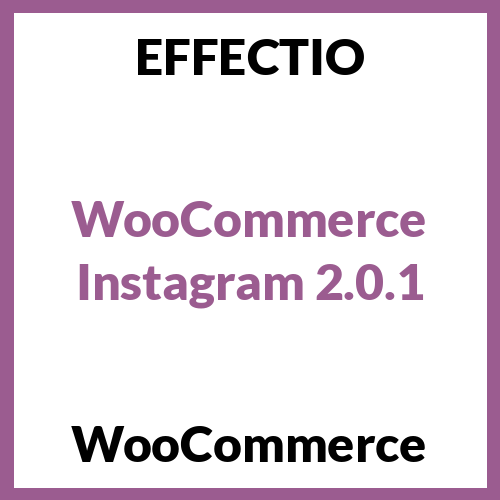 * /classes/class-woocommerce-instagram-admin.php – Optimises WooCommerce 2.0.x and 2.1.x compatibility switching. The quick response from a friendly team member at @effectioshop honestly caught me off guard. @effectioshop As an eCommerce developer, effectio.org has enabled me to reach higher expectations and my clients are very happy.